Hovingham is a large village and civil parish in the Ryedale district of North Yorkshire, England and on the edge of the Howardian Hills. The village is mentioned in the Domesday Book by its current name and lay within the Maneshou hundred. The lands at the time of the Norman invasion belonged to Orm, son of Gamal. After the invasion, the lands were granted to Hugh, son of Baldric. The etymology comes from a combination of houc meaning a place of graves, ing meaning a meadow near a river, and ham meaning a settlement. There is evidence of Roman activity around the village which sat on the Malton to Aldburgh road in those times. During the construction of Hovingham Hall gardens, a Roman bath, tessellated pavement and other artifacts were uncovered. The village is within the Thirsk and Malton UK Parliament constituency. It is also part of the Hovingham & Sheriff Hutton electoral division of North Yorkshire County Council and the Hovingham ward of Ryedale District Council. The local Parish Council is a joint one with nearby Scackleton and the council has seven members including the Chair. An electoral ward in the same name exists. This ward stretches south to Terrington with a total population taken at the 2011 Census of 1,656. The 1881 UK Census recorded the population as 600. 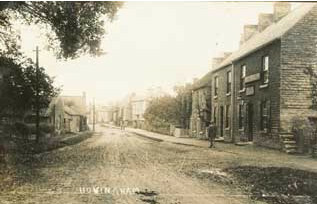 Hovingham has been home to the Worsley family since 1563 and was the childhood home of the Duchess of Kent. The sixth Thomas Worsley (1710–1778) designed and built the current Hovingham Hall. A unique feature of the grade 1 listed building is that the main entrance is through a high roofed covered riding school, once used for training horses. In addition to the Hall, the School and the two Churches, there are a total of 49 other Listed Buildings in the area. 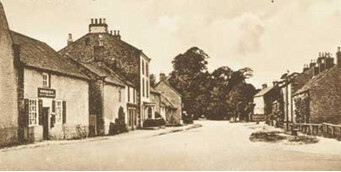 Sir Thomas Worsley was also responsible for the construction, architecture and consistency of most of the village, which to this day retains its appeal. THE PARISH CHURCH of All Saints is of Saxon origin. The majority of the present building dates back to 1860 when it was rebuilt around the tower, which dates from Saxon days. A carved stone slab on the exterior of the church is believed to date from AD 800 and a centre point inside the church is the large 10th century altar cross. The Grade II listed Methodist Chapel Hovingham Methodist Chapel is part of the Ryedale Methodist Circuit. The Chapel was originally the Wesleyan Chapel. Built in 1815 but there were Dissenters Meeting Houses in the village in the 1760s. The only school in the village is the Church of England sponsored Primary School built by Lady Worsley in 1864 and extended in 1888. It is also a Grade II Listed Building. HOVINGHAM is a township, parish and small market town, situated 9 miles west-north-west from Malton and 8 south-east from Helmsley, having a station on the Thirsk and Malton branch of the North Eastern railway; it is in the Thirsk and Malton division of the Riding, wapentake of Ryedale, Malton union, petty sessional division and county court district, rural deanery of Helmsley, archdeaconry of Cleveland and diocese of York. The church of All Saints is an ancient edifice of stone, consisting of chancel, nave, north aisle, south porch and a western tower, partly of Norman date, and containing a clock and 6 bells, hung in 1878 by public subscription at a cost of £600. The church was rebuilt and enlarged in 1860; there are 300 sittings. The Cemetery, of 1½ acres, is situated at the north side of the village. Here are four almshouses, erected in 1870 by Mrs. Worsley, for aged widows, and supported by her. 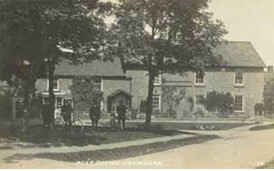 About a mile from the village is The Spa, which is much visited during the summer months by invalids; the waters are of a sulphursodaic character, and there is also a copious and very strong chalybeate spring, and one of pure rock water: the present proprietor, Sir William Cayley Worsley Bart D.L. J.P., has erected, at considerable expense, suitable baths, a spa villa, gardens and pump room, for the accomnmoilation of visitors. The Worsley Arms hotel, in the centre of the village, is a large and well-built house, with good bedrooms. Wednesday is market day, but the market is discontinued. Hovingham Hall is a handsome mansion of stone in the Italian style, built by and from the designs of Thomas Worsley Esq., c1750. 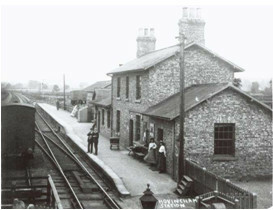 Airyholme, Howthorpe and Baxtonhowe together form a township of Hovingham parish, about 2 miles south-by-west from Slingsby station, on the Malton and Thirsk branch railway, and the same distance from Hovingham south-by-east, and 8½ west from Malton. The trustees of the Earl of Carlisle, who are lords of the manor, and Valentine Kitchingman Esq. are the landowners. The soil is sandy; subsoil, gravel and clay; and the chief crops are oats and barley. The area is 690 acres; and the population in 1881 was 41.—Letters from York, via Hovingham, arrive at 7a.m. Hovingham is the nearest money order & telegraph office. Fryton is a township of Hovingham parish, ½ mile west from Slingsby, 1½ east of Hovingham station and 7½ west from Malton. The trustees of the Earl of Carlisle are lords of the manor and sole landowners. The soil is in parts clay and limestone; subsoil, clay and rock. The crops grown are wheat, barley, oats and turnips. The acreage is 1,289; the population in 1881 was 23. -- Letters through York, via Slingsby, arrive at 6.45 a.m. The nearest money order office is at Slingsby & telegraph office at Hovingham. Coulton is a township of Hovingham parish, 2¾ miles south-west from Hovingham station, 2½ south-east from Gilling station and 7 south-by-east from Helmsley, in the Helmsley union and county court district. There is a place of worship for the Primitive Methodists. Major Francis Chomely, who is lord of the manor, and George Wilson esq., JP., of Grimston manor, Gilling, are the principal landowners. The soil and subsoil are generally sandy, and the produce mainly oats and barley. The acreage is 1,067; the population in 1881 was 131. Scackleton is a small village and township in the parish of Hovingham, 2 miles south-west and 10 west from Malton. In August 1888 the foundation stones were laid of a New Primitive Methodist chapel, to be erected at a cost of £200; the services are at present held in the upper room of a farmhouse. Here is a limestone quarry. William Henry Garforth Esq., of Wiganthorpe, Terrington, is lord of the manor and chief landowner. The soil is mixed; subsoil, blue limestone and clay. The chief crops are corn and potatoes. The population in 1881 was 165; the area is 1,460 acres. South Holme is a township of Hovingham parish, 3 miles north-east of the village, 1½ north from Slingsby Station and 8 north-west from Malton. Henry Peckett esq., is lord of the manor, Valentine Kitchingman esq., and William Franks esq., are the principal landowners. The soil is clay and loam; the subsoil clay and sand. The chief crops are wheat, oats and barley. The acreage is 438; the population in 1881 was 84.